English Heritage has a long tradition of producing high quality, well illustrated archaeological monographs about key sites and topics of importance to the understanding of the historic environment in England. Many of the past titles have long been out of print and yet are still of value for reference purposes. 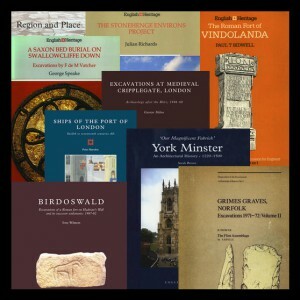 English Heritage is now making these titles available as ebooks (see the English Heritage Publishing catalogue for details) and as PDFs which can be downloaded for free from the ADS: English Heritage Archaeological Monographs archive page. need a range of workflows to suit different people. The ADS, supported by funding from the Archives and Records Association, has recently revamped our Guidelines for Depositors. The revamp reviewed the current ADS guidelines on digital archive deposition and developed updated guidance policies for depositors in light of the recent revisions to the Guides to Good Practice and the development of ADS-easy. The revision to the ADS Guidelines for Depositors has produced a new user friendly interface designed after detailed consultation with users on the most intuitive and instructive way to present the guidelines. Internet Archaeology and the Archaeology Data Service have teamed up to provide an Award that recognises the outstanding archaeological research being carried out through the re-use of digital data. 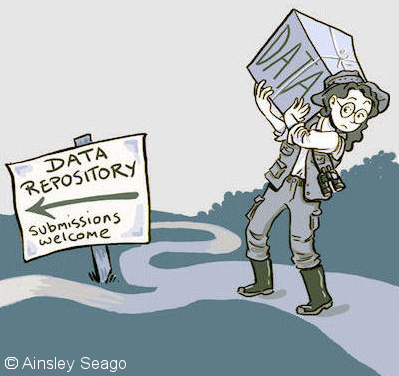 The Digital Data Re-use Award offers archaeological researchers the chance to promote their work and win the opportunity to publish, free of charge, in the premier open access journal Internet Archaeology. Internet Archaeology is pleased to announce that it has become a fully open access journal. From this month Internet Archaeology’s 130 institutional subscribers from the UK, USA, Australia and Europe will no longer have to pay the £160 a year subscription and the £7 charge for individual articles is also being scrapped, making Internet Archaeology one of the first journals to transition from a subscription model to full open access. Several things have spurred this decision. Fabrizio 3D laser scanning at Las Cuevas site, Chiquibul Reserve (Belize). This term ADS are pleased to welcome Fabrizio Galeazzi, a new Marie Curie post doctoral fellow, who will be working with us and the Centre for Digital Heritage. Fabrizio comes to York having received a BA and MA in Archaeology at the University of Rome “La Sapienza”, specializing in Late Antiquity and Medieval Archaeology, and completing a Ph.D. in World Cultures/Heritage at the University of California, Merced. 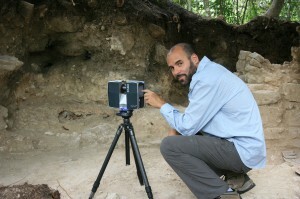 Fabrizio’s doctoral research investigated the potential use of 3D technologies for the analysis and interpretation of archaeological and heritage sites and how 3D documentation technologies, such as laser scanning and dense stereo matching techniques, are changing archaeological excavation practices. The consistency and integrity of data is essential for any digital archive. Therefore, for the past few months we have been running a series of programs to test the consistency of our file system and database and try to identify any other problems. This work started when we decided to develop a program to test all the checksums in our file system. The idea was to run the program every few months in order identify any checksums which had changed since the last run. Part of a checksum report. In addition, the program would test the checksums in the file system against the checksums in the database so that we could be sure that they were synchronised. The program took a few weeks to develop and has now been run several times. 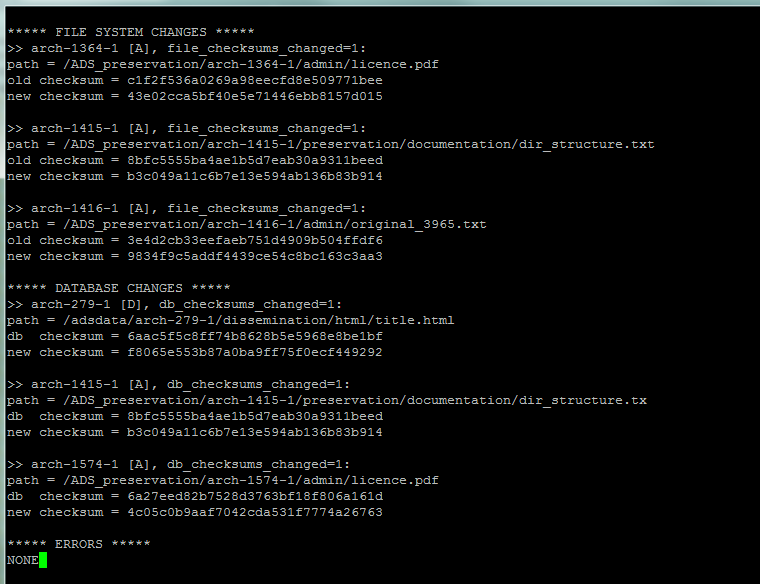 Each run produces a report which shows any checksum changes in the file system and the database. Happily, there have only been a few checksums flagged up in the reports so far and usually there have been good reasons why they have been changed.